Apple has undoubtedly taken its foot off the accelerator when it comes to expanding its chain of 252 retail stores, but the move doesn't signal any weakness in customer interest or a pull-back from expanding the brand to new international locations. Apple has cut back part-time hours, frozen retail store hiring, started using Specialists to fill empty Genius positions. It's also cut fiscal 2009 store openings to less than half last year's total of 54. But Apple has never closed an existing store since the first location opened eight years ago, a sign that it's still firmly committed to the retail initiative. Instead, operational changes have been made to match a decline in store visitors, fewer product purchases, and out of prudence based on deteriorating world-wide economic forecasts. The stores hosted 39.1 million visitors for the second fiscal quarter of 2009, down 16.2 percent from the previous holiday quarter, but up 16.0 percent from the same quarter of 2008. The stores sold 438,000 Macintosh computers during the quarter, down 14.9 percent from the previous quarter, and down 4.3 percent from Q2 2008. More significantly, the retail stores are a sales channel that Apple cannot abandon, since the chain provides direct sales and product support for a loyal customer base. Apple retail contributed a healthy 18.0 percent of the company's total revenue in the second quarter of 2009 and an astounding 25.4 percent of the company's profit during the same period. The stores also provide a significant "lighthouse" of brand awareness for Apple around the world, and remain critical centers for customer support and training. The stores hosted 644,000 personal training sessions during the latest quarter, Apple execs say, an average of 28 sessions a day for each store in the chain. The decline in grand openings will not affect other countries, where Apple is less saturated with stores. Company executives say Apple will open "about 25" stores during fiscal 2009, with about half of those stores outside the United States. For comparison, Apple opened a record 50 stores during fiscal 2008, 32 in 2007 and 41 in 2006. 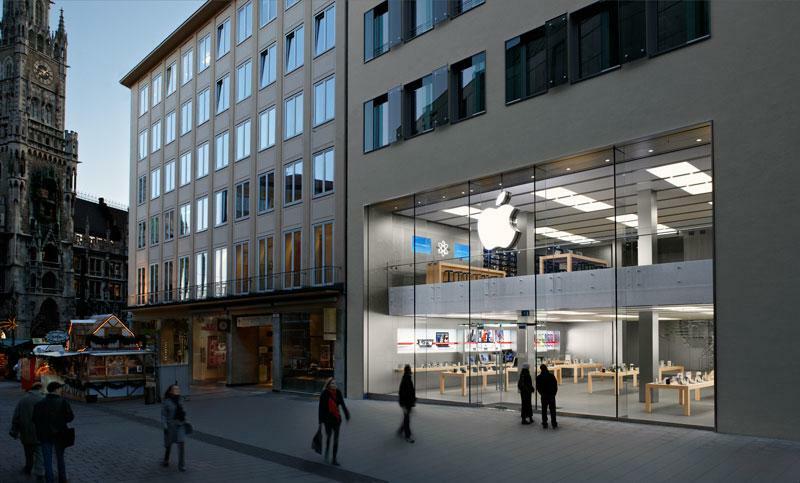 Tipsters, job openings and other sources have confirmed Apple's focus on international stores during the coming year. Stores are planned for Canada, France, England, Switzerland, China, Australia, Germany and Scotland. In fact, more than one store is on the drawing boards for the UK, Australia and Canada. Overall, tips have pinpointed at least 16 international stores that could open within the next nine months. In contrast, only 10 new stores in the U.S. have been identified for the current fiscal year. The store expansion slow-down helps explain the decrease in retail capital expenditures during the second quarter of fiscal 2009. Apple spent just $30 million on its retail stores, the smallest figure since the second quarter of 2005 when there were just 105 stores open. Lease commitments increased by $200 million during the second quarter, almost identical to previous quarters, and indicating the long-term nature of the company's contracts with mall developers and property owners. Only within the past six months has the company cut back on staffing, reducing the number of full-time equivalent positions by by 1,900 since Oct. 2008, to 14,000. The staffing cut-backs have reportedly affected mostly part-time employees, who have received fewer hours to work, or who have been furloughed. Some part-time employees receive just four hours a week to work, and promotions have been virtually eliminated, tipsters say. In some cases Specialists are being assigned to empty Genius or Creative positions, although it's not clear if they're being paid a higher wage to work out of classification. The 1,900 lost positions are certainly significant to those who are working fewer or no hours. But for an Apple store visitor, the loss represents an average of fewer than eight employees at each store. On a daily basis, the cut-back would reduce typical daily staffing by about four employees. Beyond sales, support and training, Apple's stores also continue to evangelize, an important part of increasing the company's market share and awareness. According to chief financial officer Peter Oppenheimer, about one-half of all Mac sales at Apple's retail stores continue to come from customers new to the Mac platform, a figure that hasn't declined since it was first reported in May 2006.